In this lesson, we will learn how to describe the effects of a person's reaction time on the motion of objects that they interact with. The thinking distance and braking distance for a car at different initial speeds are shown by the lengths of the two-colored bars in the diagram. The longer a bar, the greater the initial speed the car stops from. Which of the following quantities is shown by the length of the gray part of the bar? 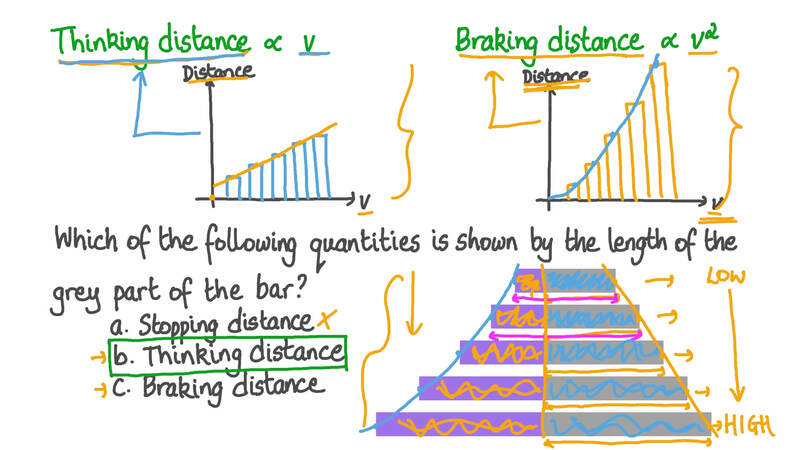 The thinking distance and braking distance for a car at different initial speeds are shown in the graph. The thinking distance is in blue and the braking distance in orange. What is the lowest speed, to the nearest kilometer per hour, where the braking distance is greater than the thinking distance? What is the stopping distance for an initial speed of 50 km/h? What is the stopping distance for an initial speed of 80 km/h? How much greater is the braking distance than the thinking distance when the initial speed is 90 km/h? How much lower is the braking distance than the thinking distance when the initial speed is 40 km/h?